This page will provide you with information about spinal anaesthetic. For further details, please speak to your consultant. A spinal injection is a type of pain management that can be used for most people. It usually offers a safe and effective form of pain relief both during and after an operation or procedure. 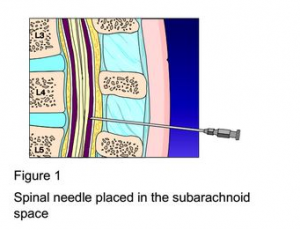 A spinal injection (also knows as spinal anaesthetic) involves injecting local anaesthetics and other painkillers into the subarachnoid space, which is a bag of fluid that surrounds your spinal cord and the nerves that branch out from it. It works by numbing your nerves to give pain relief in certain parts of your body. A spinal can be used either on its own while you are awake, or it can be used along with sedation or a general anaesthetic. A spinal can also be used after your operation to give effective pain relief. Are there any alternatives to a spinal injection? It could be that there are clinical reasons why a spinal cannot be used, such as an allergy to the anaesthetic or an infection at the site where the needle is to be inserted. In these instances your anaesthetist may suggest other methods, such as a general anaesthetic or other painkillers like morphine. How is a spinal administered? While sitting upright or lying on your side, your anaesthetist will first inject you with a local anaesthetic that will numb the area. They will then insert a needle, which will be used to inject anaesthetic. Following the injection they will remove the needle (see figure 1). It should not be painful, although it can occasionally be uncomfortable. As the spinal starts to work, you may feel a warm patch in the area being numbed. The effects of a spinal usually last for one to three hours. As well as offering pain relief, it may also make certain muscles (such as your legs) weak and lower your blood pressure. The anaesthetist will administer enough anaesthetic through the needle to ensure it lasts longer than the expected length of the operation you are due to undergo. The effects of a spinal usually wear off after a few hours. You should not drive, operate machinery or do any dangerous activities until all your feeling, movement and co-ordination have fully recovered.